Still Happening was composed in Oberlin, Ohio (2017). This work was created for dance by choreographer Nusha Martynuk. Still Happening is a revised and expanded version of Who Choose to Carry. The dance is a meditation on the ongling crisis of refugees throughout the world, including those who search for refuge among us - those for whom it's still happening, for whom it's still not safe and it's still not home. Only an empathic society can reach the core and the heart of its desenfranchised. The sound design utilizes ten speakers around the audience to evoke lands near and far, familiar and foreign, welcoming and frightening. Inflatable Trio was composed in Oberlin, Ohio (2017). This 8-channel, prerecorded score was commissioned by choreographer Lionel Popkin. 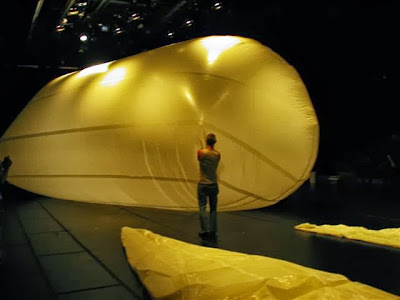 Performed on and around an inflatable plastic living room set, Inflatable Trio features three dancers, who persist, react, and cope. Each in turn upends – and is upended by – the objects, people, and situations that surround them in this domestic drama, expanded beyond its walls. Inflatable Park was composed in Oberlin, Ohio (2016). This prerecorded sound design was commissioned by choreographer Lionel Popkin specifically for performances in a public park in Santa Monica, California. Composed for portable loudspeakers, performances come to life when the speakers are carried throughout the audience as they travers the park with the dancers. Set on and around inflatable plastic yellow living room furniture nestled in the midst of Tongva Park, the dance looks, sometimes askance, at the systems of support that surround us, including people, objects and social structures. Nine dancers lean into each other, lie on top of each other, hang off of each other and bounce off the air-filled elements of a plastic family room. Sometimes a Single Leaf was composed in Oberlin, Ohio (2016). This sound design was created for dance by Holly Handman and poetry by Esther Dischereit. Who Choose to Carry was composed in Oberlin, Ohio (2011). This work was created for dance by choreographer Nusha Martynuk. Who Choose to Carry is an abstract meditation on the presence and absence of people and memory, and the loving struggle within our bodies and our hearts to carry with us those whom we have loved. 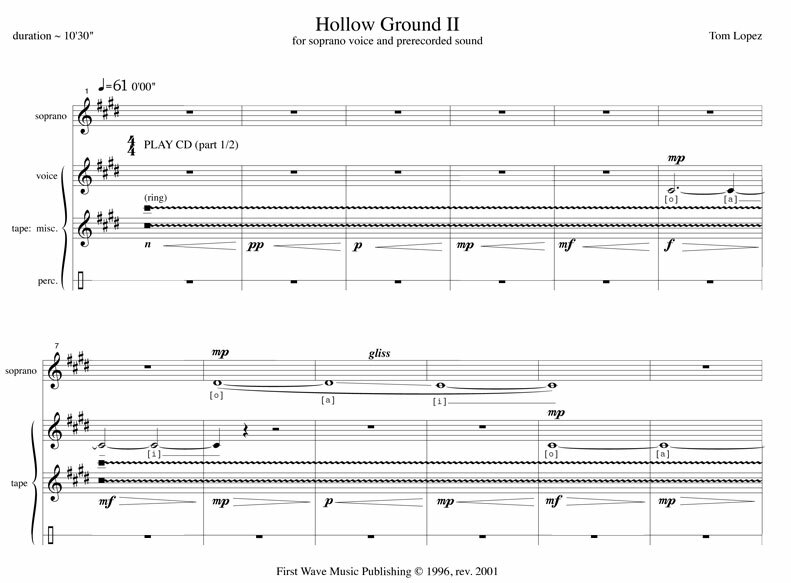 Signatures was composed in Oberlin, Ohio (2010) from a revised version of Hollow Ground II (1996). Choreographer Elesa Rosasco created a new dance for the music featuring two dancers and two sopranos. Signatures is a song without text; the vocalists never sing a word—their sounds combine with their movements to generate a strong ritualistic quality. Turning Tale was composed in Oberlin, Ohio (2007). This solo piano piece can be performed with or without a dancer in the role of the page turner. Victims of Inopportune Ardor was choreographed by Holly Handman in 2007 to the music, Dirge Déjà Vu. again again was composed in Milwaukee, Wisonsin (2006). This prerecorded score was commissioned by choreographer Brian Brooks. The Brian Brooks Moving Company premiered the work during a sold-out, extended run at New York's Dance Theater Workshop in October 2006. These amazing inflatable sculptures were created by Anakin Koenig. again again was commissioned by the Bessie Schonberg/First Light program with funds from the Jerome Foundation. 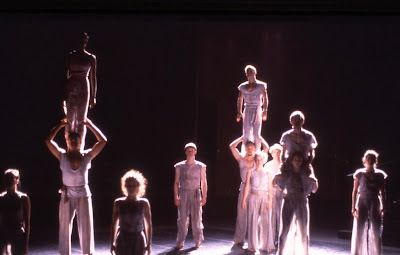 Emergence was composed in Austin, Texas (1994) and restaged in Oberlin (2005). 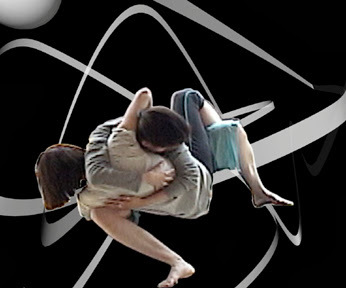 Created for prerecorded sound, performances are brought to life with sound diffusion techniques and dance by choreographer Holly Handman. The primary sound sources include the composer's voice, hammered dulcimer, and leather jacket. This is an extended work which culminates in a slowly blossoming aural flower. Emergence was originally choreographed by Bryan Green in 1994. Piñata was composed in Oberlin, Ohio (2004). This prerecorded score was commissioned by choreographer Brian Brooks. The Brian Brooks Moving Company premiered the work during a sold-out, extended run at New York's Dance Theater Workshop in October 2006. Piñata was commissioned by the Bessie Schonberg/First Light program with funds from the Jerome Foundation. Fabled Sisters was composed in Oberlin, Ohio (2004). Utilizing medical sensors to determine the internal state of two dancers' bodies (heart rate, breath rate, brain activity, muscle movement, and so on), the audio and video is modified by the actual physiology of the performers. The data gathered by sensors are sent through wireless, radio communication to a computer that converts the data to information and then sends it to other computers for generating the video and audio. This allows certain musical parameters to be determined by the dancers' moving bodies, for example: tempo, dynamics, and filters. Métropolitain was composed in Woodside, California (2004) for a video by Nate Pagel. This iteration of the piece features dance by choreographer, Nusha Martynuk. Métropolitain is the first project in a series of works based on subway systems from around the world. It features the visual and aural environment of the Paris metro. Acre was composed in Woodside, California (2004). This prerecorded score was commissioned by choreographer Brian Brooks. 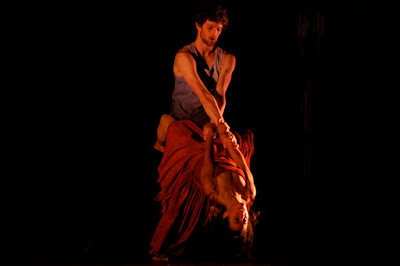 The Brian Brooks Moving Company premiered the work during a sold-out, extended run at New York's Dance Theater Workshop in March and April 2004. Acre was commissioned by the Bessie Schonberg/First Light program with funds from the Jerome Foundation. Dancing on the Atlantic was composed in Oberlin, Ohio (2003). This prerecorded score was commissioned by choreographer Mike Barber. She Measures Herself was composed in Oberlin, Ohio (2002). This electro-acoustic score was commissioned by choreographer Elesa Rosasco for a performance and installation with painter Jean Kondo Weigl. The sound world envelops the audience with recognizable material, though the sounds are often manipulated and distorted. Highly emotional in quality, the music layers the movement and visuals with a charged aura; at times, elevating and carrying the physical movement through time. Curvatures was composed in Oberlin, Ohio (2001) for dance by Nusha Martynuk, paintings by Laura Ferguson, and video by Carter McAdams. 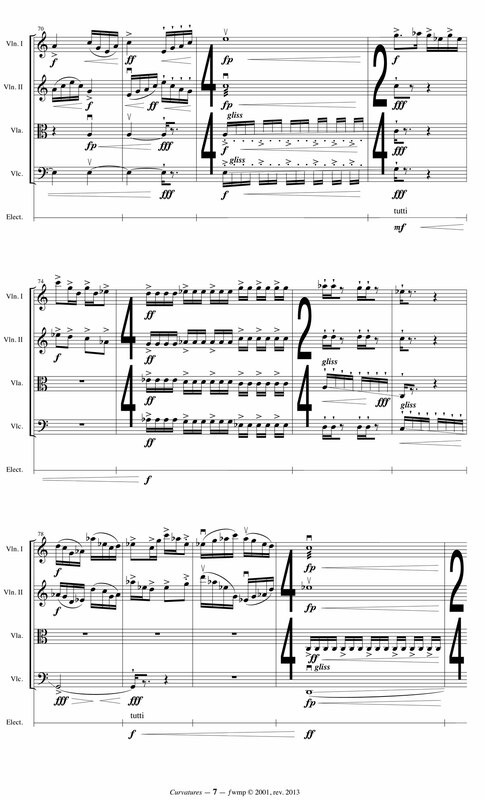 This work was created for zeta string quartet and live electronics. With the electronics, the sounds of the instruments are manipulated with effects units. Signal processing techniques modify the timbral characteristics of the quartet; sometimes to a large degree but very often in subtle ways, allowing the audience to wonder whether particular sounds are from the real quartet or a virtual quartet. One of my compositional goals was to traverse a wide range of sonic worlds. The music navigates between fast and slow, thick and thin, chaotic and serene, minimal and maximal, cerebral and emotional, and so on. I wanted to compose a piece that would keep listeners on their toes, present occasional surprises, and provide something for the heart and the brain. I am indebted to the original performers for their dedication and persistence in helping me develop this music: Erica Dicker, violin; Gillian Rivers, violin; Amy Cimini, viola; and Robin Reynolds, 'cello. Curvatures was revised in 2013 to include a version without electronics. Follow this link for a recording of Curvatures unplugged. Currents & Streams was composed in Salt Lake City, Utah (2000). Utilizing medical sensors to determine the internal state of a dancer's body (heart rate, breath rate, brain activity, muscle movement, and so on), the audio and video is modified by the actual physiology of the performer. The data gathered by sensors is sent through wireless, radio communication to a computer which converts the data to information and passes it on to other computers for generating the video and audio. Most of the music is pre-composed. However, certain musical parameters are determined by the dancer's body; for example, tempo, dynamics, and filters. This allows the creation a general score which is performed by the dancer. This work is referenced in "Interfacing Virtual and Physical Spaces through the Body: the cyberPRINT Project" co-authored by Tom Lopez. Aspect Ratio # was composed in Oberlin, Ohio (2000). This interactive score was commissioned by choreographer Celesta Haraszti for the New Music and Art Festival at Bowling Green State University. With video cameras, a computer can track the movement of dancers and modify the electronic score during performance. Hollow Ground II was composed in Austin, Texas (1996). Written for soprano voice and prerecorded sound, this work has been performed with dance choreographed by Yacov Sharir. As it is the second piece in the Hollow Ground trilogy commissioned by the Sharir Dance Company, it contains sonic material from its predecessor, Hollow Ground I. Both works contain various acoustic instruments floating around my apartment at the time: shakers, rattles, rain sticks, finger cymbals, computers, and so on. Hollow Ground II does not have any text; the vocalist never sings a word — her sounds are syllabic, which, when combined with her physical gestures during performance, create a strong ritualistic quality. This is music made from the materials within arm's reach. Artists often use whatever is available to express their vision; the "whatever" is local, but I believe the desire to "express" is global. Larisa Montanaro helped record this piece and performed it numerous times around the United States. A revised version of this work, Signatures for two singers, was composed for choreographer Elesa Rosasco in 2010. Early Morning Surface was composed in Austin, Texas (1995) from a version of Lorelei. Choreographer Liza Travis created a dance for the music featuring four performers. Mythosystole was composed in Austin, Texas (1995) for a collaborative production with director Shannon Bradford. Mythosystole is the pattern of basic values and attitudes of a people transmitted through the regular rhythmic contraction of the heart. The title is a combination of two words: mythos, the pattern of basic values and attitudes of a people, and systole, the regular rhythmic contraction of the heart. Composed in Austin, Texas (1995) for a collaboration with director Shannon Bradford. The work combines music, movement, acting, dance, lighting, and text to illuminate the importance of human expression, communication, and interaction. There is a basic story and characters to which viewers can relate, but there is also an open quality about the work which allows each audience member to make his/her own conclusions about the piece. Text for mythosystole was selected from "The Waves" by Virginia Woolf. Instruments of Faith was composed in Austin, Texas (1995). Created for prerecorded sound, performances are brought to life with sound diffusion techniques and dance by choreographer Bryan Green. 2x5+ was composed in Austin, Texas (1995). 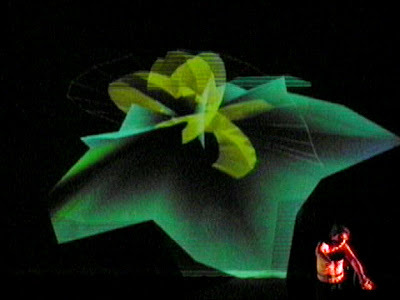 Created for prerecorded sound, performances are brought to life with sound diffusion techniques and dance choreographed by Yacov Sharir. This was the first work in the "Hollow Ground" trilogy commissioned by the Sharir Dance Company. Perhaps the most striking quality of the music is its shape; the first half heaves with visceral and energetic material, the second half slowly lightens and almost floats away before a short coda of the initial texture brings everything back to groundedness. Emergence was composed in Austin, Texas (1994). Created for prerecorded sound, performances are brought to life with sound diffusion techniques and dance by choreographer Bryan Green. The primary sound sources include the composer's voice, hammered dulcimer, and leather jacket. This is an extended work which culminates in a slowly blossoming aural flower. 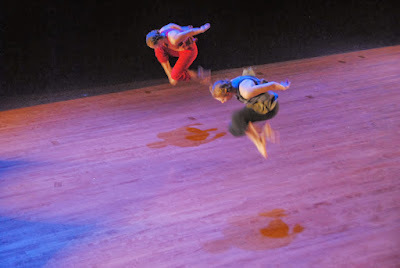 Emergence was reimagined in 2005 by choreographer, Holly Handman. Two was composed in Oberlin, Ohio (1989) with bowling balls and prerecorded tape for two dancers: Gaelen Hanson and Crispin Spaeth. Tandem was composed in Oberlin, Ohio (1989) with writer Natasha Maidoff for movement with prerecorded tape of text and music. Dropping through Bereavy was composed in Oberlin, Ohio (1989) for 13 vocalists, solo percussion by Ryan Berg and solo dance by Lionel Popkin. Collaboration: Sound & Movement was composed in Oberlin, Ohio (1988) for didjeridoo and prerecorded tape for solo dance by Nicole Richter. Current was composed in Oberlin, Ohio (1986) for The Fun Club, a performance art collective with Stephen Sloan, Hannah Higgins, Natasha Maidoff, Anne Richardson and Tom Lopez.